A few years ago I noticed lots of yellow flowers growing along the hill behind my place of work. I'd passed it off as goldenrod until I finally walked up there and found these wonderful Coreopsis flowers. 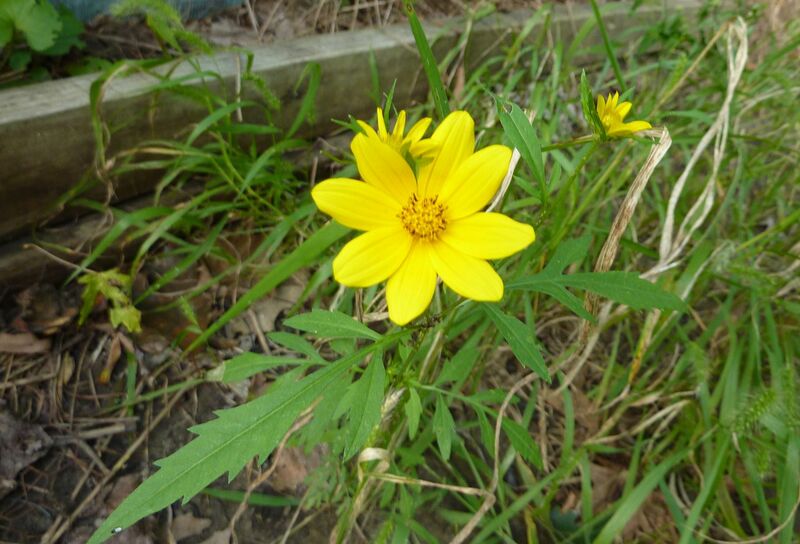 That is, I believe they're a Coreopsis of some sort. I've never identified them to species. A year later they weren't really around, but the year after that they came back in force. What was odd though is the flowers now all had this red ring in the middle going around on each petal, presumably a genetic variation that skips a generation or perhaps a sign of some nutrient in the soil. Whatever the reason, it seemed like all of them had it that year. Fast forward to just two years ago I learn they're going to bulldoze the hill to expand the strip mall. The concept of native plant salvaging was in my head at the time, so I got my shovel, went to the hillside and potted up a few Coreopsis plants. Into the garden they went... where sadly they didn't come back the next year. But then I find this growing behind our shed right next to the garden I'd planted them in. It's in a very disturbed location. I had piles of wood there for years and only recently removed it to reveal bare soil. I'm certain this must be the same species as what was growing along the hillside. From what I can tell these plants must be short lives and run on some kind of biannual cycle. The thing is the adult plants were about 4' tall and this is only a few inches. Perhaps they flower the first year at a short height and come back with more vigor on the second year. Perhaps it would have been better if I'd collected seeds? Thinking back I wonder if seeds didn't germinate better on slopes where people often sledded in the winter. Hmmm.